From smooth city streets to bumpy backroads, gravel and dirt, this versatile E-bike gives you the power to venture farther into the unknown. With the ToughRoad E+ GX, you can go from suburban streets to rugged rural backroads with efficiency and control. It’s a great way to experience adventure on ever-changing terrain and feel the freedom to extend your range. 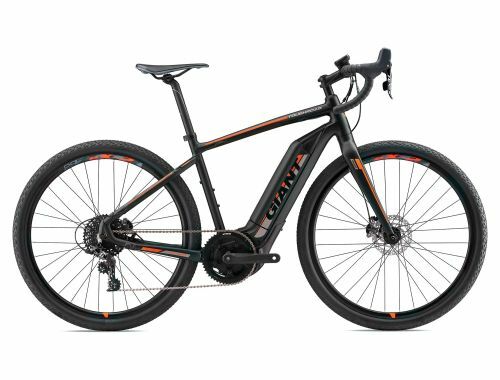 The ALUXX aluminum frameset and a SyncDrive Sport motor, which is powered by Yamaha, combine for confident handling and smooth acceleration on paved roads, gravel or dirt. Designed with wider tires and integrated rack mounts to carry cargo, ToughRoad E+ GX gives you added comfort and confidence to reimagine your limits and pursue new adventures. Ride from suburban streets to rugged rural backroads with efficiency and control. You can experience adventure on variable terrain, with the freedom to extend your range. 500Wh EnergyPak and SyncDrive Sport motor technology are integrated into the lightweight ALUXX aluminum frame. Wider tires and integrated rack mounts make it easy to carry cargo for daily trips or longer tours and adventure rides.